The skull is a universal symbol that means danger and death. 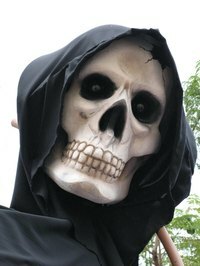 Skulls are a common sight on Halloween, when children in skull masks appear on people’s doorsteps to scare them into giving away candy. Skulls are also common in Mexico during another holiday called Dia de los Muertos, or Day of the Dead. Mexican people make colorfully decorated skulls and masks during this fiesta, held to remember and pray for deceased friends and relatives. Whether scary or colorful, this skull mask with a movable jaw is fun to make and wear. Draw a skull on the poster board, or download and trace a free printable skull template. Cut out the eyes and nose where indicated and cut off the bottom jaw. Reattach the jaw to the skull. Poke holes through the top corners of the jaw and through both sides of the skull where the jaw was attached. Align the holes in the jaw and the skull and poke a fastener through each side with the prongs on the back. Open the prongs to hold it in place. Paint and decorate the skull as desired. Shade the white skull with black and grey to make it look scary. To make a Mexican mask, paint or color it in bright colors and glue on sequins, beads and other embellishments. Poke a hole into each side of the skull and insert the ribbon ties. Make a large knot so the ribbon won’t pull through the hole. Poke a hole near the bottom of the jaw and insert one end of the wire through the hole. Make a knot at the end of the wire so it won’t pull through the hole. Put the mask on and gently move the wire up and down to move the jaw. If the jaw does not move freely, loosen the brass fasteners.